Triple Forty – looks back on the past four decades of our lives. Maybe it is a coincidence that we are of the same age, became friends and were playing together in a horn section. In fact, we choose musical milestones of our past and brought them into arrangements due to our preference and taste. The songs are tribute and esteem to the heroes of the past (Miller, Basie, Ellington, Riddle, Th. Jones, Q. Jones, Brookmeyer, Holman, Nestico), but also show the influence of those of the present (Abene, McNeely, Neumeister, Partyka – and of course these are just a few of them). With ‘Curtain Rise’, I created a fully-orchestra-show opener to announce the following tunes. The first recording I ever heard was the sound of Glenn Miller’s Orchestra – smooth and mellow – and the famous ‘Moonlight Serenade’ became my first milestone. Nelson Riddle and his period was a further milestone and ‘Falling in love…’ is a tribute to this age. For all of the musicians of this CD (and many more…), Sigi Feigl is an essential milestone. He is supporter, conductor, organizer, designer, creative director, he knows ‘everything’ and has been playing together with countless big names; furthermore he is an arranger and composer and we are proud and thankful to have him on this record. ‘Blue Orange’ is a painting I got the title from, and features Gernot (on saxes). Most of our friends live in Styria, so here are two of our traditional songs and we are really proud to have him on the vocals, the famous Austrian singer Willi Resetarits (aka Ostbahn-Kurti). He is one of the most versatile musicians of this country and a very lovely and creative person. 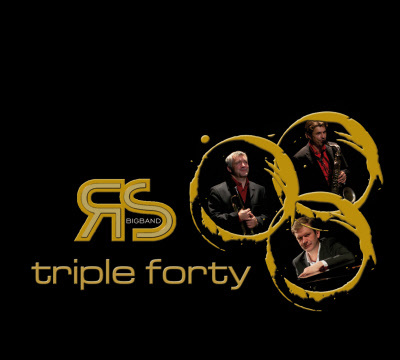 And finally ‘Triple Forty’ – we got it! Let’s see, what will happen when we are getting fifty…! ?